Beside walk-in visits, our doctors can become your Primary Physicians guiding you in all your health care needs. 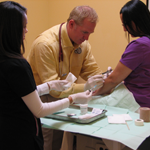 The main purpose of the Primary Physician is the continuity of care. Therefore, our clinic creates a close patient/doctor relationship to allow a better assessment of your health. With the collaboration of our other providers, Dr. Kobobel will perform routine check-ups, preventive care and health education addressing a large majority of personal health care needs. For patient convenience, our clinic provides walk-in and appointment services for Rockledge, Cocoa, Cocoa Beach, Merritt Island, Melbourne, Viera and all surrounding communities in Brevard County. Family Medicine specialty covers Pediatrics (5 years old) to Geriatrics stage, Adult Medicine, Gynecology, Yearly Physical, School and Sport Physical. 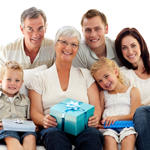 Knowing your family’s health history is also very important to treat genetic disease. Being a provider for the entire family enables us to better diagnose, treat or prevent certain conditions. We love our Brevard County families! Here at Brevard Family Walk-In Clinic, we understand how important female wellness exams are. We encourage you to get annual well women exams due to the increasing rates of ovarian, cervical, and breast cancer. It is for this reason, our providers offering thisbranch of medicine are particularly concerned with the health of female reproductive organs and the diseases thereof. For patients that feel more comfortable with a female doctor for their gynecological needs, one will be provided upon request. Our family practice does not just focus on adults – our providers are licensed to treat children and adolescents five years and up. Because the majority of our staff here at Brevard Family Walk-In Clinic has children, we understand the hopeless feeling parents get when their children are in need of medical treatment. Consequently, our medical staff makes sure that they provide our pediatric patients with medical care that concentrates on their growth and development, and their opportunity to achieve full potential as adults. Our qualified providers are able to perform the following minor surgeries and procedures in our safe and comfortable office setting: tone nail removal, wart removal, ear irrigation, cyst removal, mole removal, joint(s) aspiration and injection, drainage of abscess, steroid injections, skin biopsy, suture (stitches/staples) application and removal, and so much more. There is no need for you to see a specialist or wait for hours in the emergency room to have these minor surgeries performed. Our providers and medical staff are fully certified and qualified to handle all types of workers’ compensation injuries. From evaluation, to accurate diagnosis, to treatment and release, Brevard Family Walk-In Clinic will provide all workers’ compensation patients with the utmost attention and care. For the benefit of the patient and the employer, it is our goal to assist in the speedy recovery and return to work of each injured worker. Auto accidents can be a traumatic experience. Our office is able to treat all injuries caused by an auto accident by providing you with the best care available. With our in-house testing, we are able to immediately discover the severity of your injuries in order to determine the proper diagnosis and treatment. We can treat trauma injuries such as neck and back pain, muscle spasms, and lacerations. We also have in-house massage therapy and physical therapy. Brevard Family Walk-In Clinic is concerned with the remediation of impairments and disabilities and that we may be able to promote mobility, functional ability, quality of life and movement potential through examination, evaluation, diagnosis and physical intervention. For this reason, we opened a Physical Therapy Office directly next to our Family Practice in Merritt Island. This way, our providers will conveniently work closely with the physical therapist to give our patients the best and fastest recovery. As a young man growing up in Houston Texas, Jasen Kobobel had two main passions: music and helping people. Graduating from Kline High School with many music awards and receiving a generous scholarship in music, he had a hard decision to make; which calling to follow. He was accepted to the most prestigious music college in New York, but turned it down and decided that medicine would be his profession. After receiving two degrees in Biology and Chemistry from Houston Baptist University, Dr. Kobobel got involved in genetic engineering cancer research. However, this great experience in the latest field of medicine wasn’t as fulfilling for him as direct contact with the actual patient. He then entered St. George’s British Medical School, based on European philosophy. His residency at University of Texas Medical Branch gave him the best outlook at Family Medicine in the United States.